Bus Station — Raleigh, N.C.
Our Flashback Friday post for this week features a vintage ‘linen postcard’ image of Raleigh’s Moderne-styled bus station. It was built in 1940 and later demolished in the early 1980s. Raleigh is conveniently located on the main highways between the North and the South, in the east central portion of the State, in rolling country, on the fringe of that section of the Carolinas often referred to as the Piedmont. Throughout the city one will find quaint remains of the Old South, interspersed with the modern design of the New South. 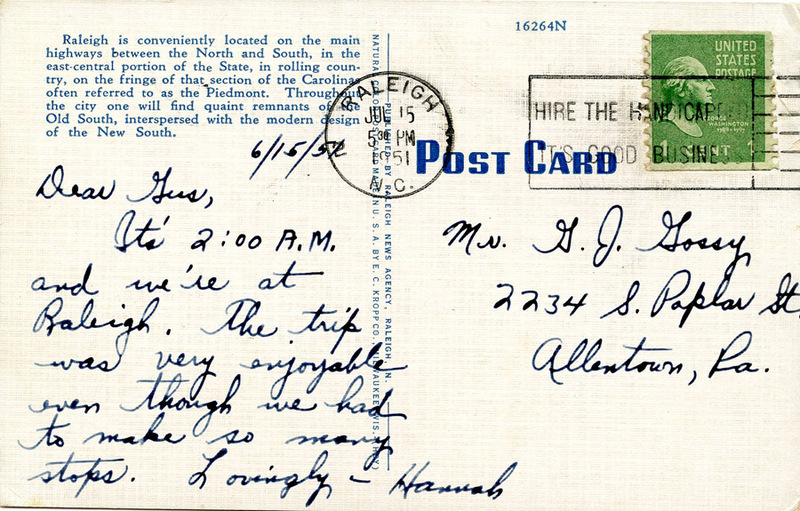 The brief message on the back was penned by ‘Hannah’ in 1951 to her friend ‘Gus’ back home in Allentown, Pa., and testifies to a typical bus trip through the South of that era. It’s 2:00 AM and we’re at Raleigh. The trip was very enjoyable even though we had to make so many stops. I wonder if any of our readers remember the old bus depot, and where it once stood. Extra points if you can identify the building seen in the background. This linen card was published by the E.C. Kropp Co.
A publisher and printer that began producing chromolithographic souvenir cards and private mailing cards in 1898 under the name Kropp. These cards were of a much higher quality than those printed under the E.C. Kropp name. They became the E.C. Kropp Company in 1907 and produced large numbers of national view-cards and other subjects. Their later linen cards had a noticably fine grain. Sold to L.L. Cook in 1956 and they are now part of the GAF Corp. U.S.
Where was the old bus station located? 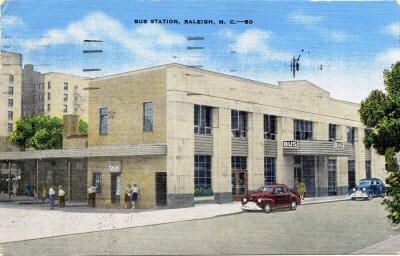 I believe that the bus station was located on East Morgan Street (200 blk) I remember when the Raleigh PD used it for their garage before it got demolished. I just google mapped this and it looks like it’s a parking garage for the city (per street view). As for the apartments, I’m not sure which ones they were, as I don’t remember them from way back when. I’m stumped on the building in the background. It keeps reminding me of Capital Apts. But that’s too far away. Would be so nice to be able to sneak a look back in time to see what the people were like. Enjoy your site. Could it be that the building in the background is the Carolina Hotel (or Hotel Carolina)? I HOPE LONG COMMENTS ARE ACCEPTABLE… IN 1950, I WAS A NORTH CAROLINA BOY FROM ALL OVER THE MIDDLE OF THE STATE.. SHARECROPPERS SON! I WAS IN THE US AIR FORCE, STATIONED AT SCOTT AFB AT BELLEVILLE, ILL. I WAS BRINGING MY WIFE TO BE TO RALEIGH TO MEET MY MOTHER AND SIBLINGS FOR CHRISTMAS… BY BUS, FROM SAINT LOUIS, MISSOURI.. IT WAS A LONG TRIP, WENT STRAIGHT ACROSS TO WEST VIRGINIA AND THEN SOUTH.. WHEN WE GOT TO THE BUS STATION IN RALEIGH, THERE WAS MY MOTHER AND MOST OF MY BROTHERS AND SISTERS (I WAS THE OLDEST OF 9) TO MEET US.. IT WAS ABOUT MIDNIGHT IF I REMEMBER RIGHT.. SO I HAVE GREAT MEMORIES OF THAT BUS STATION.. WHEN I LIVED IN RALEIGH, I TOOK THE BUS TO FUQUAY WHERE MY PARENTS WERE AND LOTS OF OTHER PLACES…. ON THE RETURN TRIP, WE WERE IN SHOALS, INDIANA AT MIDNIGHT ON NEW YEARS EVE !!! As odd as it may seem I spent a lot of time at this bus station as a child. They had the best selection of paperbacks and magazines in town. My father worked around the corner on Dawson St and, when he worked evenings, I would go to the bus station for find science fiction. Later, I would wait there for him to pick me up after our Boy Scout meetings at First Baptist Church (Troop 388). I even took a couple of bus trips that originated and returned there. One item that I not too fondly recall, and this was really strange to me a kid from a small town (Raleigh), was that the men’s room had pay toilets. I don’t know how many times I slipped under a door there because I didn’t want to pay a dime. I hope that this link works. A good picture postcard of Hotel Carolina at the corner of Dawson & Hargett streets. A lot of good views can be fournd at UNC’s North Carolina Collection — North Carolina Postcards. I remember the pay toilets! I rode back and forth from Wilmington to Raleigh when I went to school at State. I agree with Hannah, the trip was always enjoyable even though there were indeed numerous stops at rural bus stations and all along the country roads. I would love to hear some of the lists of towns that used to get read off on those buses and in the old station. Weren’t there descending walkways that led from the buses into the building? I took Trailways to Washington D.C. out of the old bus station in the late 1960’s many times. Between stops were Petersburg, Richmond and Fredericksburg. It was big deal riding the bus on trips. I liked the roomy seats and I especially loved the air conditioning. I also recall many times greeting or sending off relatives at the station. I asked my mom about the Hotel Carolina on the postcard. She said we stood on Nash Square one day as the wrecking ball was taking down the historic luxury hotel. I for some reason don’t seem to remember. A trip from Raleigh NC to Orlando Fl back in the day via bus… Grayhound OR Trailways was about 14-16 hours, lol… I remember a couple of them. To St Augustine dependent on route 10-12hrs. But I remember the old station well… walked past it everyday to school [Hugh Morson]. Thank you for the postcard pic of the bus station, I’ve been looking for a picture of this building for a long time. My mom worked for Carolina Trailways there in the 1940’s, and in the late 1960’s/early 1970’s I spent much time there in the snack bar/newsstand looking at the magazines (I wish you could still buy those toy buses). I was quite saddened to find out the building was torn down to make room for the News & Observer building, I believe. That’s why I’m glad I found this postcard on here, although I seem to recall the word “BUS” in big letters on each side of the entrance, unlike the postcard. I have such fond memories of those old Trailways buses that I created a font, “Happy Trails”, you can see at the above URL. The second picture of the slideshow there shows my mom standing with a friend at what I believe is Track #9 at the Raleigh station. Thanks again for the picture!